Now that you know how to cook Japanse rice properly, perfect sushi rice, called sushimeshi (すし飯) or shari (しゃり). Sushi rice is what makes sushi sushi - the topppings and things mixed in are almost secondary. So, for good sushi, you must have good sushi rice. Many books recommend cooking the rice with dashi, or something that has a lot of umami such as kombu seaweed. Indeed that's the recommendation I gave when first wrote about making sushi rice on this site almost 10 years ago. While that umami boost does make rice taste yummier, it's not always necessary if the things on top of the rice or mixed in the rice have plenty of umami anyway. Keep in mind that the soy sauce or other sauces have loads of umami too. One trick of the trade that I learned from my mother, who used to run a very busy sushi restaurant, is: if you want the rice to have that extra bit of shine, add a tiny bit of flavorless vegetable oil such as canola oil to the rice when cooking - about 1/8 teaspoon per rice-cooker cup (180cc/ml). So per U.S. cup it's about 1/7th of of a teaspoon...a couple of drops really. Do not add any more - you don't want your rice to be oily, just shiny. This is a good trick to use if you find that the quality of the rice is a bit subpar. For this lesson, we'll keep it simple and just cook plain rice, as detailed in the first past of this lesson. 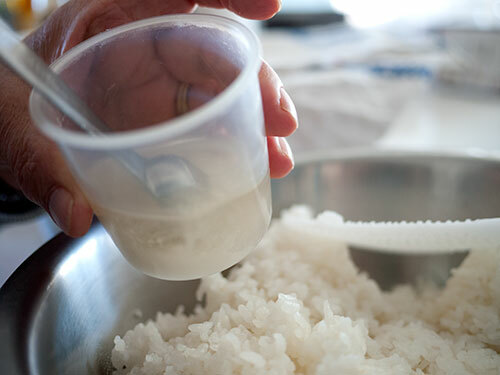 The only things we'll be adding are: rice vinegar, sugar, and salt - to the freshly cooked rice. I used some sucanat for this (which is a raw cane sugar that is light brown in color), and sea salt - just for that extra bit of luxury - but plain white granulated sugar and table salt will work just as well. Mix all the above together. That's it! Note that the amount of salt depends on what you'll be putting on, or in, the rice. If you're making unseasoned raw fish sushi, then add 1 teaspoon; if you're making a sushi with salted ingredients, such as the smoked salmon and cucumber sushi below, you'll need less. Here is another tip from my mother: as long as the rice is piping hot, there's no need to heat up the vinegar, sugar and salt so that the latter 2 ingredients dissolve. They will dissolve fine in that hot rice. Here she just quickly mixed them together in a rice cooker cup and dumped it on the rice. We used a stainless steel mixing bowl, because I don't have a nice wooden sushi oke or handai. (The wood helps to absorb excess moisture from the rice, but as long as you work rapidly a plain old bowl works well.) A tip here for rice cooker owners: don't mix the sushi rice in the cooker bowl, since the vinegar may damager the inner markings or coating, especially with less expensive cookers. Rapidly mix the rice using a cutting motion with your rice paddle. It's rather like folding egg whites into a cake batter: use a cut-turn-fold motion, trying to break up lumps vertically and letting in air so that the rice cools rapidly. Don't squish the rice grains if you can help it. 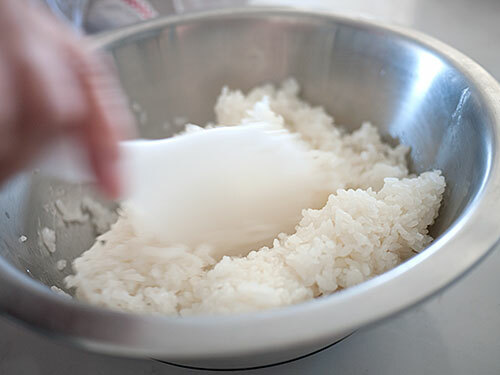 If you have a pair of extra hands, they can help cool the rice more rapidly by fanning it from the side, but if not just mix the rice as quickly as you can. The metal bowl helps to cool the rice a bit faster than wood. And so there you have it - a bowlful of sushi rice. It should still be slightly warm - the ideal temperature. Chirashizushi (ちらし寿司) means 'scattered sushi', and is the easiest kind of sushi to make. This version uses two ingredients that anyone should be able to get - smoked salmon, and cucumber. Since the smoked salmon is 'cooked' so to speak, this sushi is great for bentos. Cook the rice as per the instructions. While it's cooking, prepare the vinegar mix by combinting the vinegar, sugar and 1/2 teaspoon of salt. Set aside. Slice the cucumber lengthwise and scoop out the seeds. Slice very thinly, and sprinkle with a little more salt (not listed). Massage the salt and the cucumber with your hands, and squeeze the cucumber tightly to remove excess water. Set aside. Slice the smoked salmon into thin slivers. Set aside. When the rice has finished cooking, while it's very hot empty it out into a bowl. Working rapidly, mix in the vinegar mix as per the detailed instructions above. 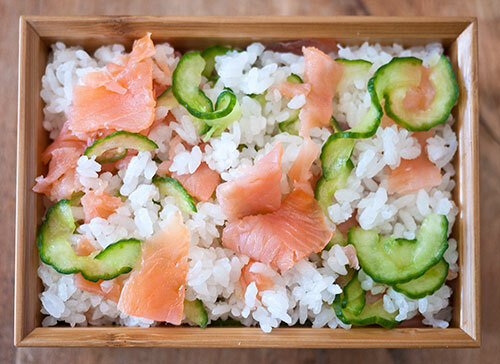 Once the rice is mixed, fold the cucumber and salmon in gently, leaving a few pieces to decorate the top. Serve on a plate, in a bowl or in a bento box. Submitted by maki on 2013-03-18 17:59. Have you ever tried adapting this recipe using brown rice? I've been trying to eat more brown rice and love brown rice yaki onigiri. And I was wondering if brown rice would be good for this dish as well - I use a sweet brown rice variety. Thank you for your site - I love it and I have introduced many of my friends to your wonderful recipes as well. My SO's favorite is the faux fried chicken recipe you have. Even my weight conscience friends will eat the skin since there is so little fat left! The sushi vinegar mix will work with brown rice too. However - I rarely have brown rice sushi, becuse 1. white rice tastes better as sushi, and 2. sushi itself is not such a 'healthy' food (shock, horror, etc for some people perhaps). I mean, it's rice flavored with a lot of sugar and salt, with salty ingredients and salty soy sauce served as a dipping sauce. Sushi is a treat, a sometimes food. Therefore, if I treat myself I go all the way and make white rice sushi. I do cook brown rice - this is my basic method still, but brown rice is only nominally better for a type 2 diabetic, so..I just eat less rice these days, period, and try to enjoy every mouthful. Hi. I was thinking about the sugar thing when I recently made sushi (inspired by discovering your site Maki thank you!) I was lucky enough to live in Japan for a year and have dabbled in the cooking since as I love the food and it is so much better for us that what is often on offer in western countries. Anyhow, I digress! I decided to try sushi rice without the sugar just to see...and not only did I like it just as much but the kids didn't even notice! Both my kids have blood pressure issues that require them to have very salty diets so now I can claim sushi IS healthy food for us!!! I know your refined tastes Maki will not be able to countenance this as real sushi rice but for anyone interested or in a similar position it's worth a try! Thanks for your site Maki, it's as close as I can get to growing up in a Japanese kitchen and I'm loving it! Making dashi lots...again miso soup is great for my sick kids. Num num, that recipe sounds delicious and I will definitely be making it. In fact it sounds like an ideal dish to take when asked to a share meal. Thanks again, Maki. This course has been great - do-able, great time line, and no pressure. This is what learning should be all about for adults. The sushi rice itself came out great, even in my cheap cooker. I tasted the rice both before I put the vinegar and such in it and after, and both tasted great. Thank you...that was delicious! One thing I love about your blog are the helpful tips, like not having to heat the sushi-zu if the rice is hot, or adding a tiny bit of oil to the rice for shine. Those are the kinds of things that you usually don't get from just a straight-up recipe book...it's almost like being in the kitchen with you...and that's what makes your blog so golden. Thanks! I was wondering if the smoked salmon would go bad if you kept it in a bento box unrefrigerated? Unless the weather is really hot, or you keep it directly near a hot radiator or something, it should be fine. (When it's very warm you'll want to pack it with an ice pack - see the keeping your bento safe on JustBento. 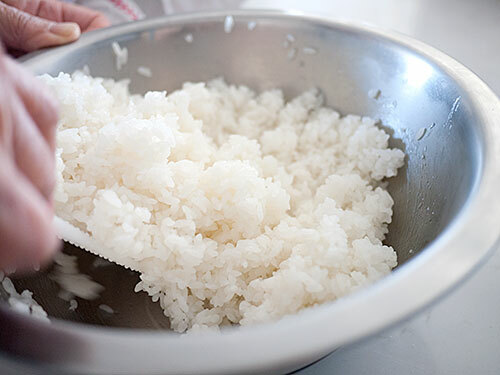 In fact it should keep better than if you packed it with plain rice since the vinegar, salt and sugar in the rice will help keep it fresh for a bit longer. Thank you *so* much. I'd never tried to make sushi until last night, because it was one of those "Mom-Only-Makes-This And It Takes Her All Day So It Must Be Hard" foods. Rice turned out perfectly (used tamaki haiga mai)! Thank you so much for the smoked salmon and cucumber chirashizushi- I have made it for my lunch and it is wonderful. All the tips and measurements have helped a lot. The Japanase Cooking 101 is a great idea by the way, I'm looking forward to trying more of the recipes. I was wondering you add the sushi vinegar in the rice you cooked after the resting time (once cooking is done) or before that resting time ? Sushi rice is one of my favorites in Japanese dishes. I love the way the rice get cooked softer and smoother. The recipe for sushi rice with smoked salmon and cucumber seemed different to me. I would love to try this. Thanks for sharing the recipe. Sushi tastes better with regular rice rather than brown rice, but you can always make them with brown rice also.